Congratulations on Winning the Long Exposure contest. I can easily see why..that is a masterpiece! A combination of solid with liquid. Fantastic mood and movement of the water. I love this shot! Reynisdrangar cliffs at Vik in Myrdal, Iceland. Reynisdrangar is a very popular tourist destination, but if you want to capture Reynisdrangar from this angle you have to get a bit away from the tourists. You have to get in from the west and cross some big rocks along the beach. When I was there the waters was very dramatic and big waves kept clashing against the rocks. I actually had to time crossing the rocks not to get crushed by the waves - be VERY careful if you try yourself! Be observant and don't take any risks! Two other photographers gave up crossing the rocks, but I had comfort in my parkour / climbing skills to be sure I could make it. 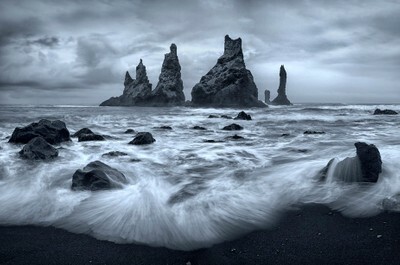 When you've crossed the rocks you'll find a little cove and it's from that position you can photograph Reynisdrangar. It was around 16 in the afternoon. I came for a longer exposure, but really felt it didn't work for me. Lots of color from my ND filter, the dull weather, the fact I used my 24-70mm and had to take three vertical pictures to combine into one horizontal (instead of bringing my 16-35mm and shooting it all in one take) all added to a rather depressed feeling that I didn't really manage to get anything useable from this location - I even returned the day after to get some other shots but they weren't that great either. Manfrotto tripod mt190xpro4. Canon EOS 5DmIII and Tamron 24-70mm f/2.8. Because of the above it was a picture I came up with at the location. I came for something else which I couldn't get, so I had to improvise. The long exposures didn't really work, so I tried to make it more dramatic with a shorter shutterspeed, where I still had some black beach visible. It seemed to work so I tried a bit more, but I wasn't very sure of what I got from this beautiful scene. All in all I came up with the idea on location. Oh yes - lots! Going through all the pictures I felt like... "waste of time", but still did give it a go. First: Lens correction and adjusting highlights and shadows. Then take the three vertical pictures and let photoshop stitch them together - I adjusted a little on the masking, to make the seemless waves. The picture had this sepia tone because of the ND filter and I didn't really like it, so I kinda put the picture aside for some time. When I found it again I just tried to make a B&W conversion and boom! There it was! I used Niks software to extract some details and then it was basically finished. 5dmIII, EF 16-35mm f/2.8L, Tamron 24-70mm f/2.8, EF 135mm f/2L and EF 70-200mm f/2.8L m1. Bring a good ultrawide lens! And be careful! VERY careful - the waves can suddenly get dangerous!